If you’ve read any of my other burger reviews you know that I don’t eat beef. I always mention that because I don’t want people to think my (often) negative reviews should be seriously considered. What the heck do I know? Well, for once I can report that I rather enjoyed a burger. 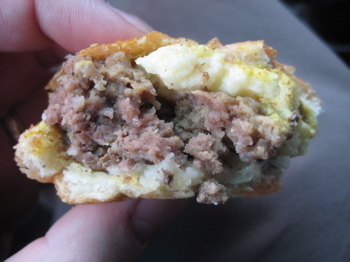 And on top of that, it was one of these gross Connecticut specialties – a steamed cheeseburger. The Roadfood list has two other steamed burgers listed, but one of those places (Roscoe’s in Hartford) has since closed. The other place, the iconic Ted’s in Meriden, was nothing short of gross – CTMQ eats it here. So I didn’t have high hopes for my second steamed burger at O’Rourke’s as I made my way there through some snow flurries a couple days before Christmas. As you’ll read below, I really did like the burger – a Christmas Miracle! Brian O’Rourke’s diner just keeps getting better and better. It’s located at the far end of Middletown’s Main Street, where the dawn air swirls with the wake-up scents of hot coffee, frying spuds, and cologne of working people ready to start their day. You can claim a seat at counter or booth and eat the most basic kinds of blue-plate fare, including masterful omelets every morning and noontime fare that can be as simple as a pancake-flat grilled cheese sandwich for $1.25 or as copious as a Rueben sandwich with French fries for $4.75. 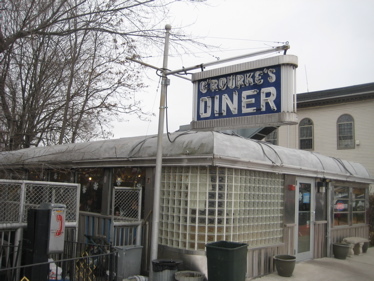 Among O’Rourke’s good everyday dishes are the steamed cheeseburger (a central Connecticut passion), … and then it goes on to other stuff! A steamed cheeseburger is very different from a regular cheeseburger. It is cooked not on a grill or grate, but in a steam cabinet, the meat held inside a squarish stainless steel tin as it browns but does not sizzle. Adjacent to the cooking beef patties in the steam cabinet are tins into which are placed small blocks of cheddar cheese. The effect of the steam on the cheese is to make it molten. The concept of steaming meat and cheese was supposedly devised in the 1920s, when steaming food was considered more healthy than frying it. Local historians credit Jack’s Diner here in Middletown as the source of the first steamed cheeseburgers. They say Jack’s began as a horse-drawn eats-cart out of which Jack served steamed cheese sandwiches to local construction works. 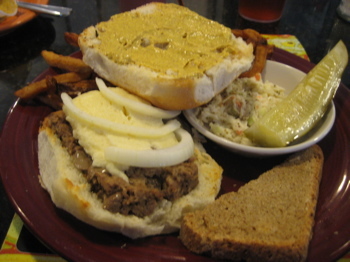 When the men wanted a more substantial, he added beef to the steam box and the steamed cheeseburger was born. Y’know, they don’t really talk about the burgers there either. Oh well. It was very busy and I was told to wait outside. In the snow. Fortunately, there was one spot at the counter where I squeezed in and ordered a Working Man’s Special: Steamed cheeseburger, soup, bread and coleslaw. All for 9 bucks. The soup and slaw were both very good, but that’s not why you’re reading this. My burger wasn’t as overly thick as the Ted’s version was. The cheese was much more uniform and had more flavor than the Ted’s version. If I’m to believe websites, O’Rourke’s has been around since 1941, so I guess they’ve had almost 20 more years to perfect this rather odd culinary tradition. I don’t know the difference between the two; the ground beef mixture, the steaming style, any seasonings used – but I do know this was a good burger. It didn’t leave my mouth all filmy and fatty feeling like the Ted’s burger. It just seemed cleaner and fresher somehow. In order to get a picture of me eating it, I asked for a doggie bag of about 2 bites. 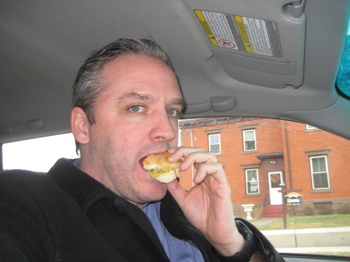 I figured I’d feel less silly about asking for that than I would taking a picture of myself eating steamed meat.